Impress Digital houses a world class digital print kit, and in fact PIONEERED the introduction of the HP Indigo 10 000 B2 digital press on the African continent. Now upgraded to HP Indigo 12000. 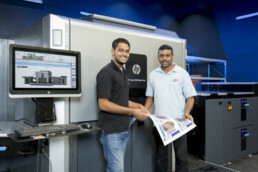 Impress was the first company in Africa to install this behemoth digital press. The future of print is digital. Before investing in major print runs, it can often make sense to walk before trying to run. For shorter print runs, Impress Digital will work with you to achieve your project requirements. We’ll check the sturdiness of your design, proposition and data, starting with small print runs. If you need just one lovingly crafted edition of your document, we’ll create that too. We’ll show you the true beauty of digital printing – giving you the freedom to experiment and ensuring the results are engaging – and do it all with lower risk and greater Return on Investment. To this end, we have over 1500 square meters of space for digital, and have invested in millions of Moola in digital print and digital print education. We house the latest digital print techniques, generating new ideas with cutting edge production to help grow your business and the industry. Little set-up is needed enabling next day, or even same day delivery. For print quantities of less than 1,000, digital printing is most cost effective. With no minimum order quantity you only print what you actually need, preventing false economy and associated environmental wastage involved in over ordering. Printing only what you need avoids having large quantities being printed only to find that you want or need to make alterations before your stocks elapse. No job is too small, so it is ideal for proofing single items before committing to larger runs or advanced copies that match the main print run that will follow. Avoid clutter or storage costs with small digital print runs. You can make communications more relevant to your audience by customising text or images specific to each individual, so you can say what you want, when you want and to whom you want. This can be extended to catering for different versions of the same document. Digital benefits from additional colours (white, orange, violet and green), which results in a wider colour gamut when used in conjunction with the standard CMYK palette, giving greater depth in imagery and more vibrancy.